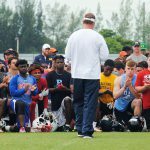 BOCA RATON – With the high school football camp season about to begin in earnest on Monday, coach Lane Kiffin and athletic director Pat Chun may soon carve out a few minutes to discuss the even-more-distant future. Summer, is a pretty good time to address future scheduling. “We have not sat down and discussed that yet,” Kiffin said. Truth be told, scheduling talk isn’t a pressing need for the Owls. 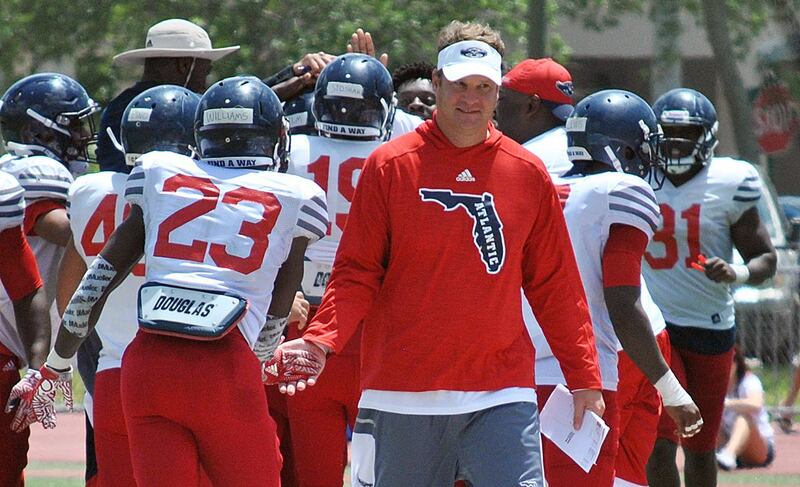 FAU plays eight Conference USA games per year, leaving four open spots in a 12-game schedule. Like most college teams, the Owls have been busy over the past few years scheduling opponents well into the future. A look at the Owls’ future schedule shows FAU has a complete set of opponents through the 2019 season. 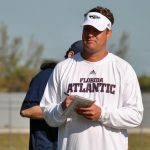 In 2020, FAU is scheduled to play at Illinois and at Georgia Southern, with a home game against South Florida. That leaves one home game remaining to be scheduled, and if FAU sticks to a trend from recent years, it will be against an FCS opponent. The Owls also have a full slate in 2021 – the year Lane Kiffin’s current contract expires. Still, Chun wants to run some ideas past Kiffin. When FAU started its football program in 2001, then-coach Howard Schnellenberger was willing to take his Owls anywhere for a game. That pleased the athletic department because teams like Nebraska, Alabama, Auburn and Texas would pay FAU fees that sometimes reached seven figures to travel to their town. FAU made money on the road, but often limped into conference play after being beat up, physically and on the scoreboard, by superior opponents. Since his hiring, Chun has attempted to steer FAU toward a model where the Owls play two non-conference games on the road – one guarantee game, if possible against an opponent that traditionally finishes in the lower half of a Power 5 conference, another against a Group of 5 team – and two home games. Those home games are often against a Group of 5 team FAU has also agreed to play on the road, along with an FCS school. In 2017 FAU travels to Wisconsin for a guarantee game, with trips to Oklahoma (2018), Ohio St (2019) and Clemson (2023) on the horizon. FAU also visits Buffalo in September, completing a home-and-home contract that saw the Bulls defeat the Owls in Boca Raton in 2015. The Owls’ season-opener against Navy also completes a home-and-home with the Midshipmen. FAU will host Bethune-Cookman in September. When Chun asks Kiffin who he’d like to play, the new coach may not be able to offer an immediate suggestion. “I don’t know that I have that answer right now,” Kiffin said.